A box of lace which she inherited from "Gan"
A box of wonderful family history, stored and treasured from one generation to the next and now it is Down the Lane. "I must wash and iron and preserve this wonderful gift......"
This was just the first batch! As you can see I became rather obsessed by the lovliness of it floating in the breeze! One particularly large piece has ended up adorning the landing window. And as a result I am adoring the landing window! So I got to thinking about lace and all the forms it takes. but that's not it at all, I thought. 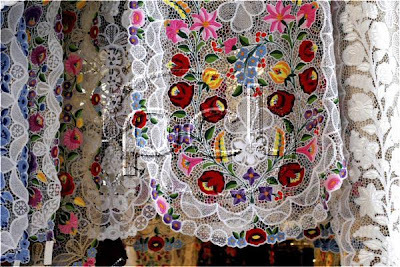 Lace is the opera of sewing, it is the prima ballerina of threadwork and it has been fashioned with such precision and beauty by women over many centuries and in every culture. Then I thought wouldn't it be pretty to add some colour? Of course lace isn't simply man-made. Discovering an impromptu seat for a little bottom to perch upon! 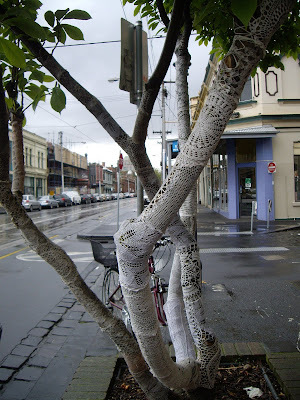 and remember outside Cottage Industry in Fitzroy, Melbourne the amazing tree festooned with crochet doilies? Makes me smile to think of it. 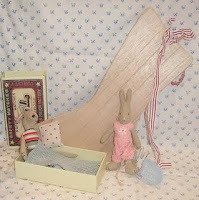 Charlotte is offering these lovely Maileg goodies so hop over and join in if you can. 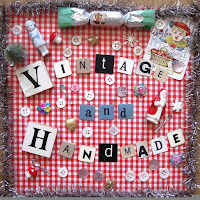 Do try and get there if you can as it will be chock full of the most wonderful vintage and handmade treasures you will find anywhere. What a lovely post full of lace-y loveliness! I LOVE lace,and have quite a collection.I suppose my favourite must be the lace veil I wore for my wedding...not an heirloom...but will be one day I suppose! What a divine post SJ. Lace heirloom in very safe hands I would say. The lace on the line.....stunning. What beautiful photos, that lace is gorgeous and it looks great dressing your window. P.S. I love that you have Tom and Barbara in your side bar, I love The Good Life. What lovely, lacey gorgeousness! I have a very large piece of Victorian black lace with gold thread embroidery - it is stunning. Thanks for the good wishes for the fair....what a pity you can't come! Lovely, lovely, lovely! I was drawn here by your title, as I adore lace too. You have been given some very special pieces. My favourite is probably always going to be Honiton lace, because I grew up in Devon where it was made, and my mum sewed antique Honiton pieces onto my wedding veil. Absolutely love your post, and all those photographs of the lace blowing in the breeze. So pretty and delicate. I am just trying to think if I have much lacy-ness in the shop but I don't think there is a great deal... A pig with red lace ribbon around her, and a christmas stocking with a lacy edge. That is it. Hmmm... might have to have a think about that!! ps Just had another look at those photos you took, on the washing line - they really are beautiful! Love the pictures of your precious laces in the wind! Have a lovely weekend! What beauty! And you put a huge amount of work into this post. It's exquisite, that lace. Love the images of the lace fluttering in the wind. And then all the observations of lace in nature and the other things, that tree is inspiring, makes me want to go and do something similar! This really is an exceptional post, fabulous! What a wonderful post - it's exquisite - lucky lucky you. I'm rather obsessed myself with the images of your billowy lace blowing in the wind. Gorgeous! Lace is wonderful and one can do so much with it... You are so lucky , to reciev all of that lace. The images in your post are gorgeous. Love your lace - especially blowing on the line. I also really like the way you integrated other lacy things. Your blog is one of my favorites and so . . I nominated it for the Kreative Blogger award on my blog today. I know you've had the award before and hope you don't mind a repeat. I've ohhhed and ahhhed admiring your amazingly beautiful lace pieces inherited from your MIL and her Mother!! Hanging there outside to dry, makes for such gorgeous pics. 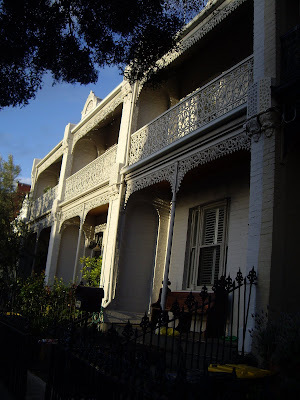 I love, love, love the stuff...in all it's forms and your post is a current favourite of mine. You have won the Maileg giveaway, yay!! I am a big fan of LACE! I have been acquiring it ocver the past few years and can't stop buying it. I admire the details and how much work has gone in to it. My favourite piece of lace has to be the one that was used to make my wedding dress just over 3 years ago. I did a post on it back in June this year. 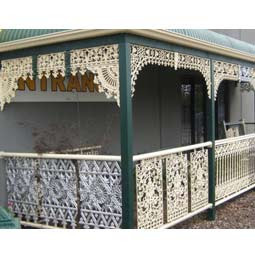 i want your washing line with lace and the crochet tree in my garden :). and thank you for visiting my blog and your kind words! I just wanted to tell you that I think you have one of the best blogs, and your pictures are just beautiful!!! So interesting!